My rating: 8.5/10. 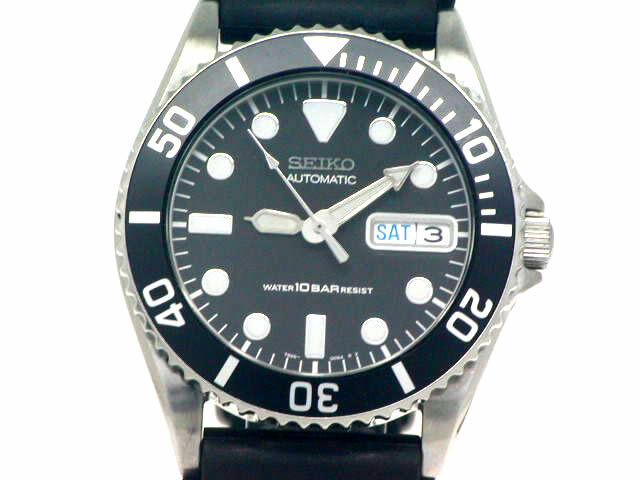 A popular men’s Seiko diving watch powered by an automatic movement. Hello everyone, today I’m taking a look at the Seiko SKX023. This is another popular diving style timepiece with a large high visibility display. It’s powered by the impressive 7S26 workhorse movement and has a 100m water resistance rating. The model featured today comes with a thick, durable rubber strap. I hope you enjoy the full Seiko SKX023 below. You can check out more of the top Seiko diving watches here. Below is an up-close image of the Seiko SKX023 featuring a sturdy rubber strap. To get things started I wanted to provide a quick overview of some of the most important specifications that people like to skim through. This is to give you a chance to have a quick look through and instantly see if this is the type of watch you’re going to like or not. For example, some people wouldn’t want to go for a very large watch. The Seiko SKX023 keeps to that typical diving watch style with a large easy to read dial featuring bold hands and hour markers that stand out against the black background. The hands and hour markers are coated with lume for better visibility in dim lit conditions. The dial features a day and date display at the 3 o’clock position, a handy feature to have. On the dial are also the terms ‘automatic’, ’21 jewels’ and the water resistance rating. 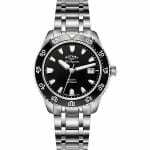 The large black stainless steel bezel can rotate either direction and features minute numbering. The casing of the watch itself is made of stainless steel with a diameter of 37mm and a thickness of 12mm. This is a slightly smaller Seiko diving watch than the previous models I’ve featured. The crown on this model is located at the 3 o’clock position. This can be screwed down to help prevent it from being pulled out whilst under water. 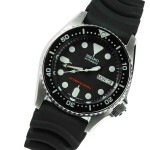 The strap of the Seiko SKX023 automatic diving watch is made from a thick and comfortable rubber. This strap has a width of 20mm and can be replaced if this is something you choose to go for. Note that the width between the lugs is 20mm. Purchase a watch repair kit for all the tools required for this job. Powering this Seiko diving watch is the well known 7S26 automatic movement, known as the workhorse movement. The 7S26 movement has a 21 jewel design and beats at 21,600 BPH. This gives you 6 ticks per second which means you have a smooth second hand movement. Note that a standard quartz would be 1 tick per second. The power reserve of the 7S26 movement is 43 hours when fully wound. This movement doesn’t feature manual winding or hacking. On front of the timepiece is a Seiko Hardlex crystal glass. This is a proprietary glass owned by Seiko and used in many of their watches. You’ll commonly find this is many Seiko, Pulsar, and Lorus watches. This type of glass is specially hardened and gives you a good level of resistance to both scratches and shattering. The water resistance rating of the Seiko SKX023 is 100m, also known as 10 bar. As per Wikipedia, this is suitable for recreational surfing, swimming, snorkeling, sailing and water sports. Note that this is not suitable for diving. I wanted to point out some of the pros and cons of this Seiko SKX023 and display them in a nice and easy to read format so you can see if this watch is right for you. The Seiko SKX023 is a very popular Seiko diver that’s often sought after as it’s quite hard to come by. If you like the design of these type of timepieces I recommend checking out my list of the best diving watches for all budgets. You should also consider the Seiko SKX007 and the Seiko SKX009. It’s hard to deny the quality of the Seiko SKX023. It’s a well built durable timepiece with a popular automatic movement at its heart. There’s also a useful day and date display on the dial, bright lume, and a 100m water resistance rating. All in all, a very good watch. Having taken a look at the quality, specifications, and pricing of this watch, I’ve decided to give it a 8.5/10. I hope you enjoyed having a read through of this Seiko SKX023 review. As always let us know what you thought in the comments section below. I really enjoyed reading through your review, but perhaps you could add in more images in future?